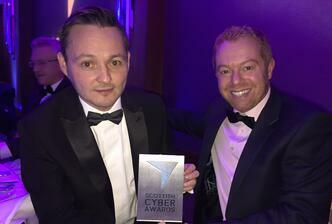 My1Login has continued its winning streak this awards season by winning International Contribution to Cyber Security at the Edinburgh Awards Ceremony. My1Login's CEO, Mike Newman, was on hand to accept to the award. Mike commented "It was a great night at the awards ceremony and we were delighted to see our team's hard work recognised with this award. It is a great endorsement of our success in selling to large enterprise customers around the globe". This award follows My1Login scooping Identity & Access Management Solution of the Year at the recent Computing Security Awards. The company is also a finalist for the Security Excellence IAM Award 2017. Our Head of Marketing, Norman Begg, joined our CEO on the night. 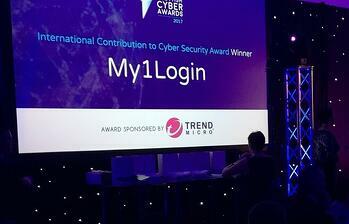 Norman commented "It's becoming a welcome habit picking up cybersecurity awards on behalf of My1Login. While I often get to attend these award ceremonies, these awards really are for our talented development teams who have built a world class, now multi-award winning, IAM solution. Thank you to them, and to all of our team here at My1Login, for making this possible."